It’s been a crazy year for crowdfunding and the momentum isn’t slowing down for 2017 either. Before the new year comes, let’s take a look at some of the most inspirational and innovative crowdfunding campaigns of 2016.
Who knew that a moon lamp would capture the imagination of so many people? On the surface, Luna is just a cool looking moon-shaped lamp, but the people behind its campaign did a stellar job with their Indiegogo video. It was the video that managed to tap into the imagination, nostalgia, and romance that made the lamp so compelling. There are plenty of internet connected cameras out there that let you monitor your pet, but none are as unique as the PlayDate. Instead of having a camera sit somewhere high and away from your pet, the PlayDate puts a camera into a ball, giving you a unique perspective of your dog or cat. You can control the PlayDate via an app to help engage your pet into playing, even when you’re away from home. This is one campaign that we here at Crowdtoolz are particularly proud of, since we were the agency hired by Glance Clock to run its campaign. 2016 was the year of the connected device, but many connected devices just didn’t do enough. Instead of trying to do everything, Glance Clock had a simple mission: show you the most important information at the right time. Glance Clock is a smart wall clock that can show you things like your calendar events, when your Uber has arrived, how well you slept and much more. In a perfect world, everyone would understand each other. We don’t live in a perfect world so we still have trouble with language barriers when we’re traveling or meeting someone. Pilot, the smart earpiece, aims to fix this with live translations. We already have similar technology like Microsoft’s Skype translator, but that technology can only be used on the desktop. The Pilot is an earpiece that can be taken with you to use anywhere you want. If it works, Pilot may be one of the most interesting wearables ever to be released. Getting in shape is one of the most difficult things to do. There are tons of exercises and diets that people try, but one thing that’s been proven to work is to game-ify exercises. Stealth is a piece of exercise equipment that turns your body into a controller. You mount your phone in the Stealth board and use your body to control and aim. The gameplay is simple, but gives its users an immediate goal and instant gratification of achieving a goal. Getting your desired weight or core strength will take a long time, but game-ifying the workouts means users will keep coming back to the exercises. Crowdfunded watches are a dime a dozen, but Undone has a unique take on their watch. Instead of releasing a ton of different models, Undone is allowing its customers to pick and choose elements of its watch to create something unique. Think of Lenovo’s Moto Maker for phones but used to customize watches. The end result is a handsome watch that users feel a personal connection with because it was built to their specifications. The overall design remains the same, with a bi-compax dial, but you can choose the dial colors, indices, hands, and case material. We all have smartphones these days, but they’re not the first tool people choose to do actual work. A phone’s screen is just too small and typing for long periods on a touch keyboard is an exercise in frustration. WIth our phones getting so powerful, it would be nice to just have one device that can do it all. That’s where Superbook comes in. This “computer” runs entirely off of your Android smartphone, allowing you to run apps like you would on a desktop. 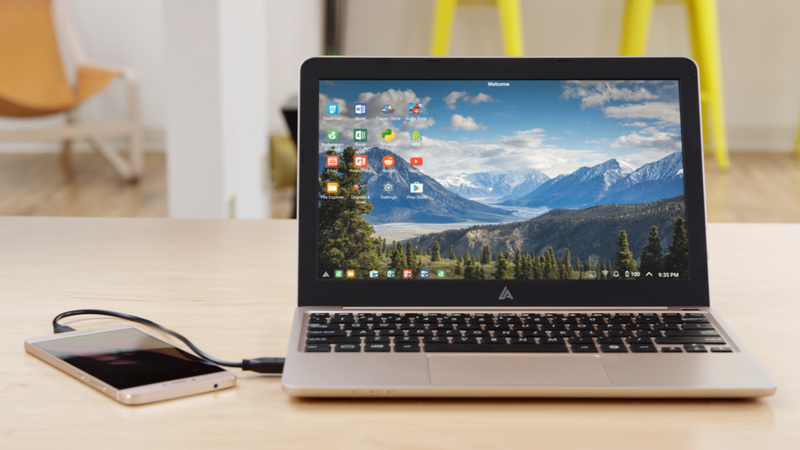 All you have to do is plug in your Android phone to the Superbook to start getting work done. Best of all, the Superbook is super affordable at $99, and will last a long time since it is powered by whatever Android smartphone you have. Electric bikes have been around for awhile now, but they’re quite expensive and require you buying a whole new bike.Where the GeoOrbital wheel comes into play is turning your existing bike into an electric one. Instead of building an entire bike, GeoOrbital came up with a crazy wheel that can be mounted to any bike. The motor and battery are both located inside the “spokes” of the wheel, and can power you around for up to up to 20 miles. If you pedal to assist the motor, you can get up to 50 miles of range. The SpeedX Leopard takes the crown for being the most funded bike campaign on Kickstarter for this year. This carbon fiber road bike combines traditional bike technology with some smart features as well. The Xcoach gives you cycling data to analyze your performance. There’s a Smart Control with built-in GPS and can turn on your lights automatically when it gets dark. At $1,500, the SpeedX Leopard isn’t cheap, but that didn’t stop 1,251 backers from supporting the project. The Everyday line of bags is Peak Design’s fifth crowdfunding campaign, and its experience shows. Peak Design crafted a great Kickstarter campaign page that convinced nearly 30,000 backers that its bags were the most useful and stylish bags out there. The bags were crammed with tons of features for photographers, journalists, and others. Its modular backpack means you can customize it for whatever task you have to complete. With previous crowdfunding campaigns under its belt, Peak Design’s Everyday line of bags rocketed to the top of Kickstarter’s charts, making it one of the best campaigns of the year. Our very own social media consultant backed Peak Design’s Everyday Backpack and loves it.